You’ve already seen the movie before. This isn’t meant as a critique of Chasing Legends , but as a commentary on the viewer. You almost certainly watched the 2009 Tour de France in its entirety, around which this movie is based. You’ve also likely digested if not devoured both print and online reports on the race, and have probably seen at least one other Tour-related movie, whether it be Wired To Win or Hell on Wheels , or Giro-centric Stars And Watercarriers and The Greatest Show On Earth. Chasing Legends aspires to explain the Tour de France by showing the 2009 race from the outside with awesome images of the race accompanied by the live commentary of Phil Liggett and Paul Sherwen, and from the inside as told by members of Team Columbia-HTC, both riders and staff, and select experts. If you’re so focused, probably nothing we write could dissuade you from seeing this film. We saw it both on a movie screen in a theatre, and on our television via a DVD. 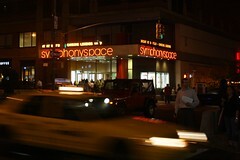 If you have a choice, opt for the theatre. HD on a big screen is that much better. High Definition is part of the film’s appeal. Much as movies in the 1950s took advantage of cinemascope, the filmmaker takes advantage of HD; he brought twelve HD cameras to the Tour, placing them in cars, on bikes, on a soigneur’s arm, wherever and his work was complemented by official Tour footage, also shot in HD. On the Chasing Legends homepage, the subtitle is ‘Pure Visual Adrenaline.’ If you like getting amped watching cycling, the movie on a big screen is an M80 to the central nervous system. The jostling going on when the peloton is at full flight seems that much greater thanks to the format. One guy goes off his line in the middle of the pack as they enter a final turn and you instantly know it and sense disaster. The movie also offers up plenty of soaring helicopter shots and stunning landscapes to further take advantage of the format. 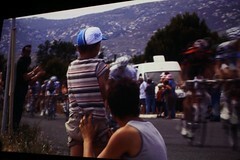 We’ve been to the Tour, seen the race from some of those vantage points and seeing the images made us ache to go back. Crashes that most of the crowd had seen before elicited pained responses as if they were seeing the crash for the first time. Somewhat curiously, the movie is aimed at the non-cycling, or non-Tifosi public. This is understandable as Tour maniacs like us are not numerous enough to support a production of this magnitude, which the filmmaker claimed cost $250,000 to make. Look at the media that covers the tour. Sites like VeloNews and Cyclingnews provide the greatest verbiage and photo and video dumps for the Tour; and have small subscriber and visitor bases. Move one step toward the mainstream; Bicycling produces less and because of a greater market share. Take another step and enter the mainstream with Sports Illustrated; their writer follows the entire tour and posts a few reports and is paid handsomely for it thanks to all the people who subscribe to get the Swimsuit Issue. What makes the aiming at the non-riding public curious is that the film has been marketed to cyclists. We found out about the movie through cycling listservs. We saw the trailer thanks to this community; we learned that the movie was playing at a nearby theatre thanks to the same community. And the movie is going to do a big night of what they hope will be one showing on 100 screens in Ireland and the United Kingdom on October 21. We’re not sure how non-cyclists would find out about the film and if they did, why they’d go. Perhaps there’s a hope of selling broadcast rights to television. That the movie isn’t made for us is apparent at the start. And that we’re not the target audience seems to be at the center of what we don’t enjoy of the movie. Chasing Legends opens with a written explanation of the first Tour and then shows us a scene that’s a video re-creation of a little boy, presumably in France during the early days of the Tour, excited to see the Tour pass by his front door. Both work to explain what the title means. The scene with the boy, however, detracts because it is such an obvious re-creation. The scene is almost a mash-up, an American director dreaming of what it would have looked like in America to see the Tour roll by somewhere between the 1950s and 1970s. This setup is a pity and the wonderful, if short, detour to hear from the oldest living Tour de France finisher seems to serve the same purpose, only with much greater eloquence. The original music also serves to advance the subtitle, while cueing the uninformed as to exactly what they should be feeling at any moment. It does heighten the adrenalin rush, but the music ends up being overbearing; occasionally we like to experience things on screen building without the soundtrack smacking us so hard. Once the movie has established that racing the Tour is an exploit of epic proportions that inspires people, it intersperses race footage, largely in a stage-by-stage progression, with banter from directeur sportif Rolf Aldag and assistant d.s. Brian Holm bantering in the team car and then cutting to interviews with riders, team officials, and a cadre of experts including Phil Liggett, Paul Sherwen, Jens Voigt, and Eddy Merckx. George Hincapie and Mark Cavendish are given ample screen time. Teammate Bernhard Eisel turns out to be the chatterbox of greatest interest. The Austrian is comfortable talking in colloquial English, and is as genial and voluble as Voigt. Likewise, the comedy team of Aldag and Holm is a treat. Not only are both comfortable speaking in English, but when they drive together in Columbia’s lead service car they banter and bicker in English, having fun even when the situation in the car and the race must have been tense; one moment they seem totally focused listening to race radio and talking and you seen Holm turn the wheel pretty hard and hear the tires screech. No oversized reaction to sliding the car registers with either. Since the movie only focuses on stages where Columbia did well, the film largely ignores the race for general classification. 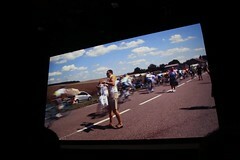 Of that, we see more clips of Lance Armstrong than anyone else, another offering to the non-cycling viewer. But that they ignore this structure takes away an opportunity for an obvious dramatic arc. Instead, the movie puts at its heart, the infamous Stage 14 controversy where Hincapie missed riding into yellow by five seconds. Blame is heaped all around, though the director makes clear where he thinks the blame should be placed. Still, the last stage is probably covered as it felt for the riders, a fun start, a tense finish, and a joyous celebration after finishing. If you can only get the DVD, you’re also buying 130 minutes of ‘extras’ on top of the 95-minute feature. In general, we’re opposed to extra features as the stuff packed in to the second disc is typically things that were deservedly omitted from the movie. In watching the second disc, we didn’t see how it helped the filmmaker other than give him more room to show things he loved. That written, we watched it and enjoyed it. Some of the extras were actually in the movie, but a few of the extra interviews are more than worth the time rehashing what you’ve already seen. The curse of a junkie perhaps. We’ve seen it before, but that didn’t take anything away from the experience.